LAST THOUGHT: If you could make it with some enterable houses that would be SWEET!! Could you make UT2004 version too ? I thought that this level was a bit to bland. Especialy the texturing on the buildings, plus a general lack of of detail. I think thats the main problem a big lack of detail. The setting could have been made much more of. Also would have been good if you could enter some buildings. What I did like was the Falcon and the speeder. 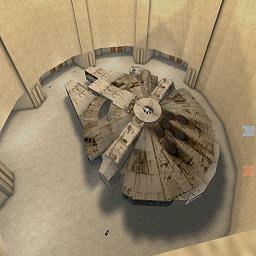 A really good amount of detail on the falcon, although again the texturing could have been better. Very bland with alright gameplay. Maybe it could have been smaller. Oh and a great music track to set the mood. don't listen to people who say there isn't enough detail. I think that there is plenty of detail. If you put in more detail then they would complain that "the file size is too big" or "it runs slow on my old computer" as far as the textures go, I have seen star wars and know that the planet is all dirt and rocks. so dont listen to them about that either. You did a good job at capturing the theme. now if the flow was better it could be a 10 easy. YEAH!! Monsterhunt will go excellent with that map!! that will fit the scheme!! not to impressive. the only good thing is the falcon. Canot go in buildings. i like it it reminds be of my earlyer as a jedi lol. 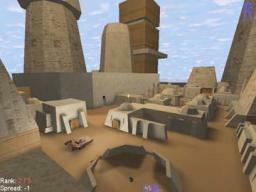 I think its a great map sorta reminds me of Star Wars Battle field. GREAT MAP DUDE! This map is awesome. Good fragging, great lighting, and I love the music. This stays in my rotation. Wow! Played this with the Jaden voicepack and Wow! !Same comment as others: wish I could go into buildings...other than that, Wow!